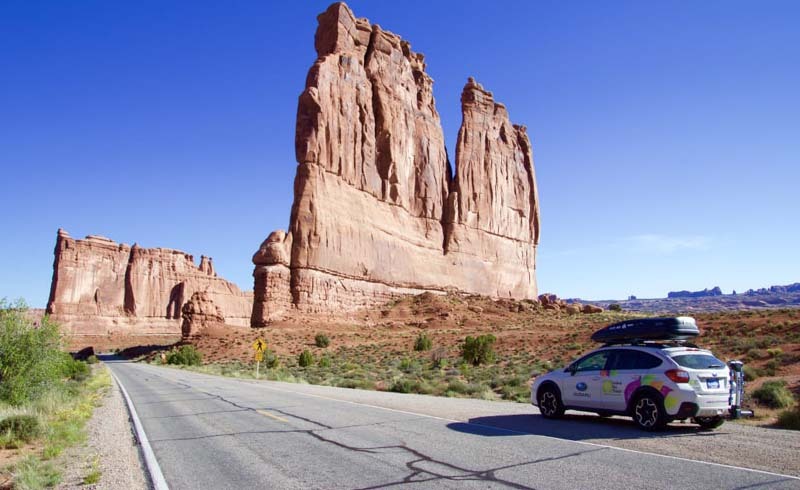 Calling all lovers of the great American road trip, we have a fresh idea for you: Retrofit your car into a living space, pack up your life, and then hit the road. 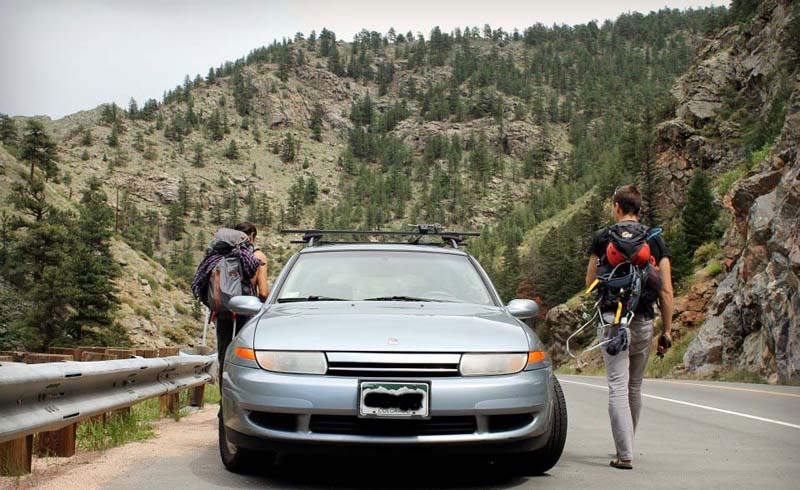 Extended vacays can get pretty pricey, but living out of a car takes care of your accommodations, thus drastically reducing the cost of seeing the world. There’s a whole #vanlife waiting for you: Here’s what you need to know to make living out of a car a reality. Before you decide to sell all your belongings, buy a car or van, and hit the road, you first need to have a clear idea of why you want to do this. For this set of nomads, it all started in 2009, when Sam realized that he could travel longer and further if he didn’t have to return home every single time. His car—the Peace Love Car (aka PLC)—organically became his home, allowing him to explore the U.S. without the constraints of a traditional life. His 'why' was clear: He wanted to travel. When Sam and Raquel (also a traveler used to living out of a backpack) met, the transition to living in the PLC was natural. Her 'why' was clear: She wanted to travel, too! Plus they both wanted to travel together. This naturally meant that the PLC was their new home. To make this a reality they both needed to create their own set of compromises. It doesn’t matter if you decide to live on a 25 foot (7.6 meter) RV, a retrofitted Volkswagen van, or in a tiny Peace Love Car—whether you decide to go at it alone or share your adventure with another human—you will need to be happy about creating compromises. For Sam that meant, sharing his tiny space with someone else. For Raquel that meant, not having a bathroom. Once you’re clear about your 'why,' making compromises is easy. The road opens up and all you have to do is prepare for what will come ahead. When boiled down to the very basics, our needs are: food and shelter. A car or van naturally provides shelter from the elements and a few customizations here and there can allow you to turn your four wheels into a place to live and rest. A simple sawing job allowed Sam to turn his passenger seat into a bed—one long enough to fit a 6 foot (1.8 meter) tall person!. When Raquel joined the team, they added a memory foam mattress to make the space cozy enough for two people that really really really like each other! Other considerations when learning how to live out of a car were privacy and temperature control. They solved this problem by purchasing bubble foil insulation from the hardware store—an easy fix that can be installed and stored in no-time. They sprayed insulation on the side panels of the car and purchased a fan. Yep, the PLC does not have air conditioning! That’s why they spend most of their summertime exploring the best instagram-worthy spots northern U.S.
As for food, they repurposed a tiny fridge made for ambulances to keep some perishables in the car and a hardware store bag to keep their non perishables. They added a few camping cooking items and they were almost set. One more thing was needed: water. To solve this challenge they installed two water bladders in each side of the car and carried a bunch of water bottles. That’s when they realized that part of their work was not only teaching classes, but planning and communicating with others. This required a lot of computer work, image processing, and to stay connected. Sam installed about 20 USB ports, eight electrical outlets, and an inverter on the car. A solar panel they installed took care of charging all that tech and an external battery. Yep, these modern day digital nomads had no air conditioning and a weird looking vehicle with more charging opportunities than the newest Tesla! They added an antenna and a signal booster to stay connected to the internet pretty much anywhere and a tablet on the dash to ‘navigate.’ By no means did they use this connectivity to stream Netflix and watch movies while they drive—nope, they wouldn’t do that. Living on the road means that you will need to be ready for whatever life throws at you. Be ready to grab opportunities or to make changes to your plans. There are road trip essentials you’ll want for living out of a car, too. Beyond that, Sam recommends keeping your toiletry bag accessible for when a bathroom appears, your laundry bag at reach for when someone offers their laundry room, and your running shoes and daypack in hand for when you see a nice hiking trail that is calling your name. Use a waterproof duffel to store your gear, and packing cubes to keep everything organized—from clothing items like socks and underwear to easily lost items like chapstick and sunglasses. If you’re traveling as a couple, then use a color-coding system of different colored packing cubes to make everything easy to find in a flash. Make plans to create the best adventures possible and be open to changing your plans unexpectedly. Is it raining today and you wanted to go climbing? Well, maybe today is a coffee shop and computer work day instead. But make sure to have your “why’s” clear and repeat them to yourself, to your friends, and to your family over and over. Only then you will be able to stay in track and to enjoy the life you have created as you find your unknown. If life on the road is calling you: Go for it. Ask for that long overdue sabbatical, cash in all of your time off, quit your job and hit the road. We dare you.